The Chinese are very superstitious when it comes to numbers, they choose telephone numbers, house number, business numbers, car number plates and anything that has numbers in very carefully. Every month we get to visit many homes and businesses on consultations and it amazes us how far our clients take Feng Shui almost to paranoia, which is not good. If you have bad numbers do not worry about it, as I will show you how to eliminate the inauspicious effects. A little story, to begin with, last Friday night I was parked outside the cinema waiting to pick up my two boys and as much as I hate to admit it I was listening to BBC Radio 4. I know you always think of the Archers or such like and this is what my Grandma used to listen too, they have some great debates on some nights. Anyway, this program was about superstition, and one of the interviewers was saying how she was not superstitious but had spent the last 30 years saluting magpies or never walking under ladders or the cracks of pavements. Well, numbers and Feng Shui, are more superstitious Chinese folklore than anything else, do I take it seriously? Yes and no, if I found the perfect Feng Shui house with a good facing direction and it was good for my family but the house number was number 4, I would still buy it although I have to admit I would use the countermeasures listed below. The main reason these numbers are considered unlucky is that the way the numbers sounds when spoken specially to the Cantonese. An example in western numbers would be the #11 could sound like heaven or #8 sounds like weight or #1 sounds like son, do you see what I mean? So if you have an unlucky #4 and you are from a country other than China. Think of #4 as sounding like “more” which is great. Let’s say your house number is 2391; you would need to add all of the numbers up until they equal to a single number which in this case would equal to 6. Let’s say your house number is 395; you would need to add all of the numbers up until they equal to a single number which in this case would equal to 8. Let’s say your house number is 85 you would need to add all of the numbers up until they equal to a single number which in this case would equal to 4. If your house number has a 4 in it, I would still suggest putting a circle around the number when it is displayed to weaken the effect. Here is a general guide for each number and if it is good or bad. If you own a home or business with a 4 or 13 is to draw a circle around the number, seriously it is that simple. The circle is extremely powerful and encloses the inauspicious effects of a negative number. So if you have a house number 4, a cheap way of curing is to go outside and draw a circle around your number or if you have time and money pop down to your local hardware store and find one of those ceramic door numbers that you can customise with a circle around the number, all this time you were worrying about nothing. How seriously do we take numbers? I would be over the moon if we found the perfect house with great flying stars and it was #8 or 88, but I would not be put off buying it if it were #4 or 13, I would use the cure as above though or change it to a house name like “rose cottage” etc. Michael has a car number plate with #88 in it; our fax number has three #8’s our telephone # has double nine, so yes we are superstitious a little but not paranoid about it and using the countermeasures above negate the problem, so please do not waste any energy worrying if your house number is 4 or 13, remember in many European countries #13 is very lucky and in Xuan Kong flying star #4 is a romance star. Also remember how far do you take it, both Michael and I were born in the forth month April, could this be bad? If you divide 8 by 2 it equals 4, you can play with numbers all you like and make them work good or bad. We are more than happy to share our content; all you need to do is give us credit for our hard work and a link back to our website. You can download and save a printer-friendly PDF file that can be emailed or use any of the vast amount of share button son the website, the more you share the better the Karma…! I would display the door number in an oval sign as shown on this page. Hi im bout to buy house num 22. please advice. Some said add alphabet i.e. 22A or A22. This can make the total to 5.. This would equal to 4 which is an inauspicious number in Feng Shui. To neutralise this, I would display the number in an oval sign as shown on this page. Hi my house number is 7545 and unit 141 do i add all of these up? You would add the numbers up separately. What would be your 1st and 2nd choice? I would go with either 906, 1806 or 2006. In case if we go for apartment number 1706 (my partner prefers the layout) is there any way to transform it in to a better/good vibration? Hi I am from India and my Flat no is 404. I have been facing lot of problems. Please suggest any remedy. I would display the flat number in an oval sign as shown on the page to dissipate the energy from this number. Hi, can you please help me? I have my home with block #6 lot#13, is this bad? How can i make it to be a good home? Please help. Thanks a lot. The number 13 adds up to 4 which is an inauspicious number in numerology. I would suggest displaying your lot number as shown on this page. My friend’s house number is 4344. according to the expression. it seems that 4 is unlucky numbers. How can she fix this issue? a circle above the address? any other token to be added to the house? I would recommend displaying the house number in an oval sign to dissipate the negative energy. I am from Bhutan and am planning to buy a lottery which is been drawn twice every month. So what starting number & ending should I buy. My date of Birth is 1980( Metal Monkey), I am a male and my Kua No. is.2, I would appreciate if you could recommend what is my lucky no. I calculated six numbers based on your Gua and they are 13-29-6-26-42 and 29. I’m looking to buy a house, the number is 45. Is this an auspicious number? What does it mean? The number 45 equals up to 9 which is a good number although the number 4 in your address is not an auspicious number so I would recommend displaying the number in an oval or round sign as shown on this page. My house is lot 4 blk 14 is this bad? I would display the number in an oval sign as shown above to neutralise the effects of this number. Hi, my unit number is 04-08 how to cure it? I would recommend displaying the unit number in an oval sign as shown above. We’re thinking of purchasing a pre-owned house that is Blk.10 Lot13 (house #13). We really like the house. Should we go on buying it? Thank you. It is very hard to advise on a house just by the number. I would display the house number in an oval sign as shown in this page as the two numbers equal up to 4. For my inquiry. We are planning to purchase a condo unit with num 224 of Tower 3. Is this auspicious to us? My husbands bday is 9/20/74 with Kua num 8. Mine is 01/14/71. I would recommend displaying the house number in an oval sign similar to the one on this page. Good luck in your new home! Thank you for your reply, Daniel. If I may ask for your help with another condo unit num 543. Will this be auspicious for us? We are as well considering this unit. It is very hard to advise just on the number of the condo although the number 4 is in the number so I would display the unit number in an oval sign as shown on the page. I’ve been seeing the numbers 8 88 and 888. What can this mean. I’ve been seeing this for 2 years now. This could be a coincidence or. I find if I am looking at a certain car to buy, I tend to see them everywhere. On the plus side, it could mean good things! If you are able to, I would display the lot number in an oval sign as shown on this page. The lot number only? how about the blk? The block number is not a problem. I’m afraid I could not find your question; could you please resend it and I’ll get back to you. I’ve copied the numbers below and if they are good or bad to help you decide your new house block and lot number. I’m afraid it would require a great deal of work to find the perfect place. It involves looking through all of the floorplans, mapping out the flying stars and much more. I would recommend going with the one that feels best to you; try to spend some time in each one and see how they feel. May I ask what is my lucky direction and number to buy a condominium? I’am born on November 20,1966 morning. Thank you. Could you please tell me your gender and I will be able to tell you your best direction and auspicious numbers. I would display the house number in an oval sign as shown on this page. Hi My house number is 14.I faced alot of problems and I Can’t be happy with my family.Whoever came to my house and they keep on said that plz better change our house number.I feel worry about that.So what number can i change ??? I would display the door number in an oval sign as shown on this page. This should be enough to avoid problems. These would be two separate numbers and would not be anything to worry about. Hi Daniel, I have a question. I know my sister was talking about th e number 4.my roommates boyfriend just bought a home with the number 34, and offered my roommate and I to rent. I know the 4 usually applies to buying a home, does it apply to renting a room since I don’t own the house. I really would like to save money and can’t necessary not consider it since I can’t afford to buy another place.She also brought up 3-4 like three deaths. It’s been on my mind on occasion.what do you think, is it really bad luck? If, I stay, anyways to prevent it the negativity? Since I’m renting, not too much I can do in the home. I would not let it worry you too much; if you do move there, I would request that you can place an oval door number sign as shown on this page. With situations like this, it is always good to weigh up the pros and cons. Thanks for the reply. I can ask but if they say no..is it really bad? It’s certainly not the end of the world but I would recommend placing it if you can. I intend to change my mobile phone number the last one I have adds up to 31 which is 4 and it hasn’t been good for me at all. Which numbers are best for a mobile phone when added up? Also any numbers to avoid being inside the phone number? Would greatly appreciate your prompt response. I’ve copied the numbers below and if they are good or bad to help you decide your next number. Buying a house we have a choice number 20 and 21 can you let me know which is a better number for fortune and health. Either of these two numbers are good for a home. We are planning to get a home :#12-169. It adds up to a 19 which is karmic number? So a little worried. I am born on 31st and my husband is the 25th. Will it be ok? This would add up to 1 as you add it up to a single number. The number 1 is a good number in numerology so I would not worry about this. for my house no 44…im doing business at my home pls advice which is better.. I would recommend displaying the house number in an oval or round sign, yes. You can usually buy them premade at hardware stores. Appreciated if you could advise car plate no with VW 718? I’m considering for my new car plate no. My born date 10July1972. Thank you! Hi! Is 22nd September 2018 lucky or unlucky day to get married? I`m born on 22nd June (life path no 8). Thank you! If you can tell me your gender and year, I can check the date on the Tong Shu Almanac. Yes, thank you! Here are more details: 1978, woman. He is February 9, 1974. Thank you very much! Saturday 22nd September 2018 is not a good date for marriage, unfortunately. The best thing you can do is try to start the ceremony between these dates as these are your auspicious times of day to help counteract the Almanac – 03:00 – 04:59, 11:00 – 12:59, 13:00 – 14:59, 15:00 – 20:59, 21:00 – 22:59. Good luck with your big day, Aleksandra! I mean getting married next year 2019. We are trying to pick a wedding date that will be lucky for us both. Which month and date do you recommend please. If you could let me know which months you are looking to get married, I will look for the best dates for you both. my house number is 44. Kindly advise what to do. 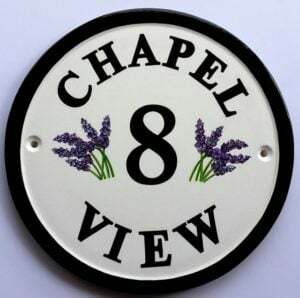 I would display your house number in an oval or round sign as shown on the page. Hi, is lot #17 house #9518 a good number?. Also, another question is you can see the fireplace from the maindoor, is it good or bad?. Thank you!. The lot number adds to 8 which is good and house number adds to 5 which is fine. I would try and break up the flow of energy by placing something between the door and fireplace if you can. If the fireplace is very close to the front door, this may not be a problem. Hello.I take my personalised car number is 1260..is it good? Your red number equals 9 which is very good in numerology. Hello Daniel. Thk u.I want to ask you another question. I have another personalised car number is 603..perhaps later will take another number..between the 1603 and 1680.which is the best for abandance and everything? I would go with 1603 as this equals to 1 which is a good number. 1680 equals up to 4 which is the most inauspicious number in numerology. either of these two address have good numbers. I would not personally pay attention to the letters. You should do what feels right to you as you need to be comfortable although the letters do not fall into numerology in my opinion. I would recommend block 7, lot 6 as the number 6 is good for numerology. I hope this helps and good luck in your house search! I born in 10 January 1987. I’m going to buy a new car and i have to select a number plate that is lucky and good in overall sales and business and good health. I’m an insurance agent and investment advisor. Among the SIX numbers below , appreciate your advise which three are the best numbers for me? I will bring this to JPJ to check the number availability.. truly appreciate your help.. The best number plates out of this last are VBV 1611 or VBW 3268; if I had to pick one, I would go with VBV1611. Good luck with your new car! Thanks for your advise and guidance Daniel!! My office unit number is 214, how can I make it nicer to bring more luck? I would display the office unit number in an oval or round display. I am very much interested in a house and the number is 258. My mom said it means no fortune. But if we add the digits, it equals to 6. Please advise. Thank you so much for your time. You always equal the number up to a single digit in numerology and 6 is a good number. Your auspicious numbers for your date of birth are 10, 12, 23, 24, 35, 47. I would try and avoid 24 and 47 as 4 is an auspicious number. The best number would be 35 for you. Hi I’m hoping you can help me please. I am thinking of moving into a number 35/8 house and I really like the energy of the place however I read that number 8 houses are not suitable for people born on the 13th and I’m born on the 13th of October. This has really threw me off and I’m paranoid now. Should I invest in a different property? The number 8 is very good in Feng Shui so I would not worry about this. If you have a good feeling about the house, this is also very important. Good luck in your new home if you decide to go for it! Hi Daniel can you help me please I found a property that I really love and the energy of this house is perfect for me or so I thought until I read on a website that number 8 houses are not suitable for people born on the 13th which is my birthdate and the house is a number 35 can you give me any more insight into why it’s unlucky and can I change this? Hi, Good day! We are planning to buy a new house. Please I need your advice, which is good? Block 4 Lot 13 or Block 4 Lot 15 or Block 4 Lot 5 or Block 4 Lot 6? Thank you.. I would go for any apart from block 4 lot 13. That will be fine; just be sure to put a circle around the block number if it is on display. Hi there we have recently brought a block of land its number is 22 and street name is palais- which adds up to 22 using the pythagorean numerology chart. Is this good or bad? I would display the land number in an oval sign if it is on display anywhere. Hello, We bought a house august 27, 2016 and the house number is block 4 lot 2? Is this a lucky house? Thank you. The number 4 is inauspicious in Feng Shui so I would recommend putting a circle around the number if it is displayed to neutralise the number. The number 2 is a good number. We just bought a house on lot #49 and the street address is 194, i believe facing West. Please advise. How to cure the lot # since it is not visible. Thank you so much. I’d greatly appreciate it. If the lot number is not visible and displayed on your home, I would not worry about it personally. If you wanted to, you could put a red circle around the deed to the home although this is down to personal preference. Good luck in your new home, Mel! In numerology, these numbers are fine and nothing to worry about. I am so glad I found your website. We are buying a brand new home. The lot # is 49 and the street address is 194. I believe is facing West. Is this bad? And how do I cure the lot # and the street address? I appreciate your help on this. I would display the lot number in an oval sign to neutralise this number. If you love the house, I would go for it and display the name in an oval sign! Hi! Is is okay to buy a house with numbers Block 13 Lot 9 (Facing east)? It is fine to buy a house with these numbers although I would display the block number in an oval or round sign. I would not worry about the house number. The number 8 is very good in numerology. I would make sure the new home is clear and free of clutter once you are settled in to attract fresh Qi. If you live in a country with good weather, be sure to keep the windows open as long as security will allow when your first move in. My house number is 404, which sums up to 8 but has two 4s in it, should i make a red circle around it as well? Also, I have stuck number 4 at the back of my door, as my life path number is 3, so that 404 + 4=12 and 12 will sum up to 3. Am I doing it the correct eay or need to change something here? Could you please help me as well? Of course, what can I help with? Sorry, I’ve just seen this. I would still display the house number in an oval sign to avoid problems. If you are able to, you could draw a circle around the number plate or do it on the back of the plate. My car number is ,GJ23 H 9310, as per numerology, I am adding only 9310which sums up to 13, ever since i bought it, I have faced lot of problem with it, like major accidents and car break up. I am suppose to follow the number plate rule of my govt. So It’s not possible for me to make a customised name plate with a ring around it. Can you help me provide a solution in this case? I would also want to Thank you fir helping out people so humbly. I would take the plate off and draw a circle around the back. Thank you so much for guiding me. But a bit confused, draw a red oval sign behind the plate, in the center , which will not be visible when I hang it back, is that okie? It is a tricky one but I would try to remove the plate and draw a circle around the back. I just signed a contract for a house at 107 Continental Dr. Is it good, bad or ugly? Thanks. The number 107 equals to 8 which is an auspicious number in numerology. The lot number equals to 4 so I would display this in an oval sign if possible. How about I bought the house block 9 lot 40. Kindly advise. I would put a circle around the lot number as the number 4 is inauspicious in numerology. Hi, my husband & I are looking to buy a house with the number 13606. We have 5 kids. Will this be a good number for our family? Thank you very much in advance!!!!!! Your house number adds up to 7 which is fine in numerology; it’s not the best number but it wont cause problems. Good luck in your new home, Katie! Thank you for replying! I really appreciated your time! Hello, is the number 4148 lucky or unlucky, how do I determine it, Many thanks!!! You provide great information! The number has 4 in there two which is inauspicious in numerology so I would recommend displaying the number in an oval sign as shown above. We are looking at an appartment 323 and a half. I automatically wanted to make it a 323.5 = 4 bit it was advertised as 323 1/2 = 2. How would I add these or would I disregard the half 323 = 8? I would personally class this is 323 which would equal to 8 which is an auspicious number in numerology. If you are in doubt, you could display the apartment number in an oval sign for safe measure. Thank you so much. You have been so helpful! That was what I was hoping to hear. I have been made an offer to purchase a flat.House 35 Flat-3B.Please suggest. The number 35 equals to 8 which is an auspicious number in numerology. The number 3 is also a good number. Hi, I’m in the work of buying a food business with the number 2000. Is that okay? The number 2 is a good number in numerology so I would not worry about the number. Good luck in your venture! Your house number adds up to 3 which is not a problem in numerology. To add the numbers, you add all three until the get to a single digit although if you have a four in your number, it is best to display the number with a red ring around it. Just got my license plate number 256. How is that number and should I be adding up the letters to it as well or calculated separately from the numbers? How to calculate the letters? Sorry for many questions. 256 would add up to 4 wouldn’t it? My answer would be exactly what you said, Mila! September 10th is a good date for starting a new business. Good luck in your new venture, I hope it all goes well for you! House number 13 and business 419 is it a bad number? the number 13 adds up to 4 which is an inauspicious number in numerology and the business number has a 4 in it so I would display both numbers in an oval sign. Our apartment number is 407, do we just enclose 4 in a circle or entire apartment number? Also I read somewhere about circle being red? I would display the apartment number in a circular door sign with red around the edge. You can get nice metal ones from most hardware stores. Hi..i believe in feng shui even I’m not a Chinese it’s because I can see a lot of positivenes there.so I tried to find a way at least I can read in articles or blogs or what ever posted in social media.i was planing to run a little business and now I made it and I did some good luck for start but I didn’t open yet my store because I will wait the date of 8 this January.i was born April 18 1989..thank you for this web.i have some opinions to take.. The last one actually is 48 Pine Hill instead. This one is also good and happy New Year to you too. I have been in the process to purchase a new house. The realtor showed me several interesting houses for me to choose from. Which the following is the best choice from the Feng Shui point view and why? Thank you. Happy New Year! I love the positive names of these roads like Joy MT and mountain view, this is actually important too, 1/9 Sky look and Joy MT are best but the other two are not that bad as road names are good. I’m thinking about opening a small Korean restaurant. My birthday 06/09/1983 and husband 03/07/1985. My name will be on papers and husband will mainly help in kitchen. It there a business name numerology that I should considered? The number 310 adds to 4 which is an inauspicious number so I would display this in a round sign with read around the edge. Good luck with your restaurant, Amy! hi! We will be renting a House with address BLOCK 1 LOT 3 . is this ok? or it’s considered as #13 and 1+3=4? I would not worry about this as these are two separate numbers and 1 is a good number and 3 is ok.
Dear Mr Frank, I bought a condominium unit 5th floor room number 43. I’m an aries and year of the dragon. Thank you. My apology Mr Michael Hanna for addressing you a wrong name. The floor number is fine and the room number equals up to 7 which is also fine. If you wanted to, i would display the room number in an oval sign as you have a 4 in the room number although this is not crucial. We own a house with address B13 L24 P2. We dont have any numbers posted in our gate. Is this a bad address? Thanks. I can see nothing negative about this address at all. Hi..just want to ask if nov.24,2017 or nov.25,2017 lucky numbers for ooening a business? I purchased a home with number 652, lot 175. Do I need a round door sign for it? Thanks. I would have it with a round door sign. on feng shui based on floor and it says to avoid the 6th floor for monkey. I am not sure if its best to take it or look for another floor number. The problem with Feng Shui is that there are so many layers to it and applying all of them when looking for homes to rent or buy is impossible, you will always find a negative. Personally, this would not worry me at all being on the 6th floor and the apartment number is fine. I am so sorry to hear about your mum. The combination of numbers is not good at although I doubt it caused this problem. I would place the number in a round display. 301 equals to 4 which is an inauspicious number in Feng Shui so I would recommend displaying the door sign in an oval or round plaque. Hi we are selling a newly built house number 44, front door is north facing. Can we do anything to improve the number? It adds up to 8, is that any good? Do we need to display the number in a round shape? In what colour please? Any date this year for the sale to go trough that is particularly lucky? 18/11/17? Or 08/01/18? Thank you. Hi, I would place the number on a round display and as you say look on the positive side that it equals 8. Out of the two dates, the most auspicious day is the 8th January. Hi my onlineshop total letters is 13 is badluck? & my car plate is oy1666 is it bad luck too? what to do? These numbers would not worry me and neither should they you. Hello. We found a house we love but I am concerned about the address 45455 before we make an offer. What do you think? The address equals to 6 which is an auspicious number although there are two fours in the address so I would recommend displaying the number in an oval door sign. isnt it 23 which is 5 not 33 which u thought was 6? Hi can you please tell me is no the 10 good for a shop or not if not what do I have to do . The number one is an auspicious number so I would not worry about this. I would display the address in an oval or round door sign to avoid problems with this number. Hi I’m thinking of setting up a business and the building is number 20. I’m drawn to the number 7 but believe 8 would be good in business.What would you suggest? The number 20 is an auspicious number. & is good but 8 is more auspicious so I would suggest going with your personal choice. 4 is not a good number where Feng Shui numerology is concerned, I’m afraid. The number 474 adds up to 6 which is good so it depends which you look at it. I would decide on personal preference on the car as you can always change the number plate to a personalised one. I would purchase a round door sign similar to the one displayed on the page as this will fit in well and look good. The presence of the circle is what helps protect rather than it looking aesthetically good. I’m planning to buy a new house; it is located in Blk 14, lot 24. What is the vibes with the number? I would display the numbers in a round or oval house sign as shown on the page. The lot number equals up to 6 which is very good although it does also contain 4 which is an inauspicious number so it would be best to display in the rounded sign. Good luck with your new house, Ron. My parents just bought a new house number is 22 it is bad or bad. 22 does equal up to 4 which is an inauspicious Feng Shui number. I would recommend displaying the house number in an oval or round door sign as shown on the page. Wishing your family the best of luck in their new home. My family just bought a new house the home number is 22. It is good or bad if we sum 2+2=4. I want to buy a house with number 15 and another house is with number 34, which one is a good one to buy regarding the number. The number 15 is good with regards to Feng Shui. The number 34 is not good and I would advise displaying the number in a round door plaque. Hi, Just wondering, is house number 15 and 34 good to buy according to Feng Shui?. Please reply asap as I don’t want to miss it. Thanks. Hi Michael. I hope you can help. We are currently living in Europe and will be moving into our rented house No.3511E in USA this November. Will this be a good number for us? The house number equals up to 1 which is an auspicious number in Feng Shui. Good luck with your move, Sik. We are currently choosing a good wedding day for next year 2018. 1. Which day is lucky? March 18 (318), June 18 (618), or Aug 18 (818) ? 2. Also if 8 is a lucky number why is August considered bad luck/ghost month even if its the 8th month? When selecting a wedding date, you should use the Tong Shu Almanac. If you send me both dates of birth and gender, I will be able to tell you the best date to get married. We just bought a lot #31 and a house #3217 facing east direction and it’s #4 Can you please give me some advices ? Thank you! I would use a round or oval door sing in red or black. Please help me to choose my future car number plates; 299, 300, 302, 311 or 312. I need an answer in the next 14 hours. Sorry, I have only just seen your comment. The best number plates would be 299 and 312 although 299 is the best out of the two. Your address equals up to 1 when you add them all together which is a good number in numerology. Hello Michael, my house address is block 20 lot 13, is this good or bad number? Your lot number adds up to 4 which is an inauspicious number and I would recommend displaying the lot number in a round plaque on your home to negate this. Yes, I would recommend drawing a round circle around the door number. Front door of my house has the house number 103 written in red on a white rectangular sticker inside a rectangular border in red..can you please let me know drawing a circle around 103 would help…thank you for helping us out..good bless u..
Hello. My house number is 31B. Is it a good number? Please advise. Your house number equals to 4 which is an inauspicious number so I would recommend displaying the number in an oval door sign. Hi is no 54 a good house no. The house number has a 4 in it which is inauspicious so I would recommend displaying the door number in an oval door plaque to avoid problems. My house no. is 44. What should I do to counter the bad luck of the no.? Can I add a letter of the alphabet to balance the bad feng shui? I would recommend displaying the house number in a round door plaque. Im planning to buy a house.. im choosing between block 4 lot 4 or block 4 lot 6. Which one is better? My husbands birthday is march 1. Do i need to put circle on it? I hope you can help me. I would say that block 4 lot 6 is the better out of the two based on numerology. Iam buying a house that is block 13 lot 13 is this a good number? Your block and lot number equals to 4 which is an inauspicious Feng Shui number. I would recommend display the block and lot number in a round door sign. I am planning to buy a house with number 7420 which adds up to 4. House seems decent and my family liked it most over other houses we saw. Kindly advise should I buy this house? One more point house is built on lot 121 which again adds up to 4. It is hard to advise on a property without seeing it although with regards to the house number, I would display it in a round door sign. Is a new house number 4448 or 4446 good? Do I need to buy a circle around each number 4 in the sign. the two numbers are not the best and I would recommend using a round door number sign for the whole number; you do not need to place a circle around each number 4. Is 138/2 good number in my house. Your house number equals to 5 which is not the greatest number in numerology although I would recommend using a round door plaque for your home to negate this. The number 1900 is fine with regards to numerology. I have just been allocated with a house number 24… much to my distress I have called the local council to see if this can be changed but to no avail. Our house was lot 106. What do I do? What type of plaque should i use? Can I use the words “twenty four” on the plaque? Our house is North facing. I would recommend using a round or oval plaque for the door sign to avoid any problems. I would not worry too much about this. Thank you!!! Also would it be okay to put the round plaque on the letterbox or does it have to be on the door? In red or in black. Thank you! May I also ask if the plaque can be placed on the letterbox or does it have to be on the door? Further, do the circle and/or numbers have to be in red or black colour? Just one more question what color should the number and the circle be – red or black? The sign will be fine in either red or black so this is just down to personal preference. We saw this house that we really like and the house number is #16. Is this a good number? Thanks so much in advance! This is a good number in numerology. Good luck with your new home. The number 16 adds up to 7 which is fine in numerology; it’s not the best number but it won’t cause problems. hi! I am thinking of buying a lot number 1313. Is it a good number? Thanks! Your lot number adds up to 8 which is an auspicious number in numerology. My home number is 28646. Is it ok? Your home number equals to 8 which is an auspicious number. I live on the 4th floor of apartment building and my unit number is 425 which adds up to 11, which is auspicious as mentioned above. Should I put a circle around it bc we are on the 4th floor? Or is there another way to resolve this 4th floor issue? If it is not bad luck pls let me know because I became concerned after reading about the number 4… Thx!! I would not worry about living on the 4th floor personally. The number four is an inauspicious number but this does not relate to your personal address. I would just put up a circular door number sign for your apartment. Hi I am picking between 4414 and 4412 for an address. Which is better? Can anything be done about the two fours in the beginning? I am worried about all of the 4’s. Thank you in advance. Out of the two, 4412 is the better number for the address as this equals up to 2. The home is a number 26 which equals 8, however it’s front door is NorthEast facing. I have read that 8 is good, and the number 26(and reversed 62) is not. Would this number need energy correcting? Would a red or orange door help this direction? The number 8 is auspicious in numerology and I would say you do not need to correct the energy. I’m thinking about a restaurant in a shopping plaza, the address is 4790 S Hagadorn Rd Suite #144, good idea or find a different space? Here is another space 300 Frandor Avenue Suite #444, good idea or find a different space? 4790 equals up to two 20 which is a good complete number in terms of numerology. Good luck with the restaurant, Amy. Does the round/oval house sign need to be just plain black/red? The ones that i saw at Home Depot have gold outline to them. Thanks! The gold outline will be fine to use. How about if my house address is 434? Is this ok? I would recommend purchasing a round or oval door sign for your address as this will disipate the effects of having two number 4’s in your address. Hi Amanda, The sign can be oval shaped as well. Hi. Would like to ask if 3380 is good number for car plate? Tq. Looks like a good combination for a number plate. How about an address with a unit or apt to it? My address would be 280 Unit #4 – do I need to put a circle around it or should I just avoid at all costs? I would recommend purchasing a round door sign for your unit to have the number 4 on display. I am looking a new house with the nomber 45. Is it good or not. Pl suggest me. thank you. I am looking for a new house with the nomber D -45 or A -10.Is it good or not. Pl suggest me. thank you. The A-10 is probably the better number. I brought a house with the number of 23A – 7 where the actual number is 24. Is this a bad number? i dont know what number to use, i live in a townhouse. my unit numer is 153. but my street house number is 548. I am staying in the house no is B-177.Is it good or bad. Pl give me the suggestion. Your house number equals to 6 which is a good number in numerology. If it (D-45) is not good then what is the remedies. Pl suggest me . I would just have a circle made around the number, in the UK we have house numbers in circle shapes which are perfect. Hi Michael. I am considering buying a home with the house # 13440. Is that bad since it has #13 and two #4? 31 is not the best number in numerology as it adds up to 4 which is inauspicious. To resolve this, I would purchase a round door sign for your new home. Apologies for the late reply. the number adds up to 11 which is considered auspicious in Feng Shui and also good for relationships as it symbolises two people side by side. Sorry for the late reply, I would place the number is round display, if you read the article here you will find more details and hope it helps you. I would display the lot number in a round or oval house sign as shown on the page. The lot number adds to 6 which is a very auspicious number although it does also contain 4 which is an inauspicious number so it would be best to display in the rounded sign. Good luck in your new home, Mae. Im looking at a house that is numbered 23. Is that fortunate? The number 23 is not the best number for a house although this can be resolved by using a round door sign on the front of the home to display the number. The #18 is a great number and would not use a circle. Hi is 8819 good number? Yes, this is a good number. There are two eights in the number which is very fortunate. I am choosing between the two addresses for my dream home. I would go with Blk 12 lot 9 although you also need to make sure you are happy with the location. Good luck with your new home, Myaida. This would be 8 energy and very good. Either name will be good as you have eight in the name which is very fortunate. My friend maria referred me here. we bought the same place of apartment but I was given 2 option only. we are basing only through the main house number. I would say the first option is the best as the number is good. Also, you should not base an apartment just on the number, you need to feel happy in it yourself. Good luck in your new apartment, Joahnna. Block 8 lot 141, block 8 lot 137 , block 14 lot 329, block 7 lot 4, block 16 lot 237. Going by the numbers only, block 8 – lot 137 looks the best but this is only from a numerology point of view. Wow what a quick reply. Thank you so much. One of the best and concern person. YOU ARE VERY HELPFUL TO EVERYONE FOR AN IDEA. Sir Michael, Block 8 lot 137 is the apartment number but as ive checked its on 4th door from the entrance u think it will affect coz its 4th door or no problem because were basing on house number..
Hi sorry to disturb I know I keep emailing you my apology. I Called my agent to check and give me different house number available he message me a new house number just now..
2. BLOCK 7 is not updated on the system there is chance it might not be availble when i go there tom. Can you give me the best number for lot number 8 only. Our family will appreciate your advice.. I would go for BLOCK 8 LOT 138 first or BLOCK 8 LOT 141 second. I would go for BLOCK 8 LOT 138. Most SE Asian would avoid this combination of numbers but mostly due to superstition but it is good to have the 8 in the lot number. Thank you sir Daniel for your advice. Should I also use the round door sign for the number 4? Yes, i would use a round door sign on the #4. I am thinking of leasing a space for business with a suite # 220. Please let me know if it’s bad. The number 220 in Feng Shui is fine and i know you may think 2+2 = 4, it does not work like that all is good with this number. I would probably choose 8899 as this represents today’s and future wealth, enjoy your new car. We’re trying to buy a house #774. I’ve learned #4 isn’t good, but the sum makes 18. Would You please advice if it’s good or not. 774 is not bad at all and as you say 18 is a positive number and it would be a number i would choose. Your reply is so much appreceated!! Hi, not it is not that bad although i would frame the number in a circle. If you read the article you will see that if you are not sure about a number you should draw a circle around the number. The article gives you some ideas. We are looking at purchasing a house with an address of 50 or 48. Which number is better? I have a new house with the number 44. What can I do? My wife is half Chinese. We like a house, number 41? Shall we buy or leave? 4 is not good in a house number although the solution is to purchase a round door sign and make sure the number is inside the sign as shown in the picture on this page. We like a house number 41. Is this a good number? The number 4 is not a good number although I would not let it put me off my dream home. The remedy to this is to make sure that the house number is presented in a round house sign; this is an easy fix and can be bought at most DIY shops. Good luck with the new home. We\’re trying to purchase a home that has a block # 6150. Can you please advise if it\’s good. I truly appreciate you response! Thank You! I would say that the block number is ok and should not cause problems. I am looking at a condo 1404. Is it a good number ? Its not a great number but you can weaken this by placing a circle round the condo number such as a plaque. Putting a circle round the number tends to neutralise the ill effects and should avoid problems rather than weaken. Are they good or bad? Appreciate your response.Thank you. Hi, 88 is considered the most auspicious and 1601 second best, the other two numbers are not great. I am moving to a flat # 86 is it good or bad ? I am a fire Monkey. Thank u Michael. Just signed for it today. It felt good going up the elevator and the digitized voice saying 8 when door opens. This will be everytime I reach my floor and double flying stars 8 wait for me at my door facing South 🙂 Happy :). Or should I say Thank u Daniel ? Can you please tell me if the number 58, which makes it a 4 number is bad and can we rectify it by putting a circle around it. Hi Lillian, the number 58 is good, anything with an 8 is good so no remedy is needed. I would not make any changed with the number, #6 is good. The number 14 equals up to 5 which is not bad and should not cause any problems. If you are concerned about the 4 in the number, you could buy a door number sign and use a circular sign for each number. Good luck with the property. If possible, I would put a circle around the number 4 on your company logo as you suggested. 3429 is considered a good number as it adds up to 9 and I would not worry about this number. Planning to get house with number 4525 . Is it a good number? the number 4525 equals to 7 which should not cause problems. I\’m planning to get a new car and just checking on which car plate is the best (877, 978, 2868, 6828, 6882)? All numbers work well except for 877. Just bought a house #669. Is it a good number? 669 will add up to 3 which is not a bad number although I would purchase a circle door plaque for the front of the home. We are shopping for a house. Here are the adress we will visit this week-end. Please can you tell me the best number? Now I\’m living in a number 74 and my life is a nightmare and I need to know before to buy a new house. The best number out of that list is 6391 although this will also come down to the actual home and how it feels for you. I live in house 4A can you suggest what can I do thanks. I would purchase a round door number sign for your home and have the number 4 inside the circle plate. 32 is a great number. Hi can you give details in what respect is 2208 good number . They are quite good although 28 is slightly better. Personally i would choose the right home rather than worry about the number. My house number is 2208. Please suggest if it is good or bad? 2208 is a good number and you do not need to make changes at all. This number is absolutely fine. I have a house sign # 4 (light gold colour) as small metal (on top of silver metal letter box) plate glued to the left side of s brick fence. What colour (eg, blue, red, etc….) should I circle the sign # 4? Please advise, thanks, Dan. You should circle the number in either red or black if possible. Is it best to sell our lot blk.13 lot 4 or placing a number with circle on it will be ok as cure? Planning to build our house by next yr.pls help.thanks. I would place a the block and lot number in a circle as this remedies any ill effects. Your home address equals to 8 which is a very auspicious Feng shui number. Your business license equals to 3 which is not great although it is not one of the worst. When displaying your license number, you can play a circle around it e.g. on invoices etc. Hi, My wife wrote you about our house number 2474 which you said to put in a circle. Do you mean the entire number goes in one circle or do you mean each of the 4 numbers has its own circle? Thank you! My house number is 346. Please let me know if it is unlucky since it has number 4. As you said, the number equals to 4 which is not auspicious; I would place the house number in a round sign outside your home to avoid problems. The best thing to do is purchase a round door sign for the door number. Me & my wife are buying a property lot. We want to know if the number is ok. Both the block and lot number are good. Good luck with your purchase. we just brought a Lot , the number is block 20 lot 29, west side. Is this a good number? We stay in aren\’t end appartment .door no is 301!!! Is it bad??? If so what should we do ??? Over all last three years we are facing a lot of problems:(:(especially fertility related.plz help me. Thank you so much for your kind reply and help.will do it ASAP.can you suggest some more easy tips to conceive our baby ?? I do have five lucky bamboo sticks (living area) two metal elephant hanging on bedroom door.please help me. Monkey peanuts are a fantastic Cure to place beside your bed in a bowl for fertility; I would recommend trying this. Your apartment number equals to 6 which is an auspicious number. my apartment no is A1-02-03 is it good or bad no? Thanks. Hi, Planning to buy a house with # 18. How good is the number. I am a born on 20th Feb 1976. Please let me know. The number 18 is an auspicious number in Feng Shui. 4903 when added together equals to sixteen which is an auspicious number. Good luck with the house purchase! Thank you so much. I feel so much better. Thank you !! Hi, I just found out our house has a terrible number. It is 2474. We have lived here for 30 years. Is there a way to cure the bad number? When you add 2474 together, it equals to seventeen which is an inauspicious number so I would suggest having house number signs made up for your home with a round plaque as shown below as this will weaken the influence of the numbers. When you add 2474 together, it equals to seventeen which is an inauspicious number so I would suggest having house number sign made up for your home with a round plaque as shown below as this will weaken the influence of the numbers. well my parents house is 33, my appartment in the number 13 and my office 44. What do you suggets? I would apreciate your advice. I would suggest having house number signs made up for the two homes and office with a round plaque as shown below as this will weaken the influence of the numbers. Hello I am planning to buy and shop; the shop has everything positive besides it\’s number which is number 13. Should I buy this shop? I\’m afraid that I cannot advise on the shop just on a number alone although when dealing with inauspicious numbers, you should display the number for the shop in a round plaque to weaken the influence of the number. We are looking a townhome and its really beautiful but what i am worried about is the street number where the townhouse is located is in 4\’th street… The house number though is #125. Do i need to be worried about this street number and what is the cure for it? I cannot out a circle to the street sign…. The house number equals to eight which is very auspicious. I would not worry too much about the street number as the effect will be spread across a lot of homes. the number two is an auspicious number although the number 4 is inauspicious as it translates roughly to death. with the number 4, if you have a door sign for the lot 4, I would have the number displayed in a circle plaque. Congratulations on your new home. 2567 will equal to 20 which is auspicious as it is an even number. I hope you have a great life in your new home and make many happy memories with your daughter. We moved into a house number 160, things feel a bit out of sync professionally. We lived happily in a house adding to 14 previously. Please advise what to do? We recently moved into a house number 160, things feel a bit out of sync professionally. We lived happily in a house adding to 14 previously. Please advise what to do? I did a Life Answers Report Numerology reading for the Month of September. 44/8 whats the cure for this? and how to minimise anger? The fact that this equals to 4 is not a problem, it is more if there is a 4 in the actual number so I would not worry about it Rinku. I am a Realtor listing a house in an area with a lot of Asian buyers. My clients want to list their property at $484,900. Is the negative effect of the 4s negated by the 8 and 9? Would it be considered a luckier number to list at $484,888? I would recommend listing the property at £484,888 if possible as like you said, the 8\’s will help negate the effect of the 4\’s. Thank you for the article above. I am moving to a new property and the adress is the following: Flat 1, building 705. Would you be able to help me understand the vibration of this number? the 7 and 5 in your building number add up to 12 which is a good number. 1 is also a good number which means you have a good address. That\’s great, thank you so much 🙂 I was just worried as all the numbers together (1, 705) added to a four. Thank you so much for clarifying! My business number is 157,..which sums 13 = 4…I put the number inside an oval Red color (not a circle). Is it going to work too? The fact that it is an oval line instead of a circle makes any difference? Apologies but I have only just come across this as it was in the spam folder. I would try to buy a sign that is a circle for a door number sign if possible as this will be much more effective. We have recently moved into a appt 404 and a new office A102, things are not working out too well since then, both professionally and personally, worried! It is impossible to give you detailed advice without seeing the buildings but the best thing you can do is put a circle around the building numbers and you will be amazed at the difference that this will make. My wife and I are planning to buy an apartment unit 404. We are worried about the number as its double 4. Just want to ask if it is bad luck? The positve way to look at it is that 4+4=8 which is the most auspicious number to the Chinese. Personally, I wouldn\’t let it put me off. The positive way to look at it is that 4+4=8 which is the most auspicious number to the Chinese. Personally, I wouldn\’t let it put me off. I have been living in a rented flat 1228 facing NW for the past 2years. We have had severe relationship problems and finance and health have been erratic. We have to renew in June . If I dont get a better one would drawing a circle around the flat no suffice? Hello, a co-worker of mine just purchased a home with the address \”144\”. He and his wife are having a house-warming party in a week. What feng shui cure/gift can I give or suggest to help diminish the inauspicious effects? Will my question be answered? Does this message system work? i am planning to buy a house… is 4453 or 4463 house no. ok? what should i do? can I put rectangle or oblong in it? hi we are buying a house number 22 as a rental holiday property near the water can you help with any suggestions? If it is the number 22 you are worried about, this is not bad at all and nothing is needed. Since I have moved into this particular apartment 13/4 an inconceivable amount of crisies have occurred in my life and the life of those I am accountable for. I never considered my apt # until i just recently did the math and read about 13/4 house numbers. I was shocked to see descriptions of the horrendous roller coaster ride I am on. Please I need to know how to get out of this apt. This was to be a temporary residence and yet we have not been able to get our selves out and now feel uncertain of our future. I am worried what will go wrong next. And to note I was NOT superstitious and did not know anything about this 13/4 number until just this past week. I have a house number 5, street number 9. I think is by itself is very good [ 5 elements etc], and we know that 9 is good also. Together, im not sure? What does a house number 1465 mean? I understand 14 isn\’t good, please advice what to do. Thanks. We are moving in to a house number 62. please advise if it is a good or bad number? 6 and 2 adds to 8 which in Feng Shui, is a fantastic number and with regard to the Five Elements, the number 6 represents metal and the number 2 represents earth which is fortunate as metal enhances earth in the productive cycle. To put it simply, this is a good number for a home and you should look at this as a positive number. If you wanted to get a number plaque for the home, I would recommend using a good quality slate in rectangular or square shape to compliment this. my house number is 1589. Kindly advise what to do. Thinking if buying one of two houses in North Texas one address is 2455 which is a 7 and the other is 553 which is a four worried about my family we have 4 children and these are the best if what if what we can afford will simply putting either address in a circle or maybe an oval help? Thank you for your help! My house number is 31. Is this a good or bad number. Drawing a circle in this number can help if its not a good number. Thank you. You may have learnt that 31 is an inauspicious number as the two numbers equal to 4 although you have the elements wood and water from the 3 and 1 which can be very good. Is the numbers 444 in the prefix of you phone number bad? Please let me know so that I can decide what to do. I\’m sorry to say but my personal view and the majority of south east Asia would say that this is bad and is not considered a good number.